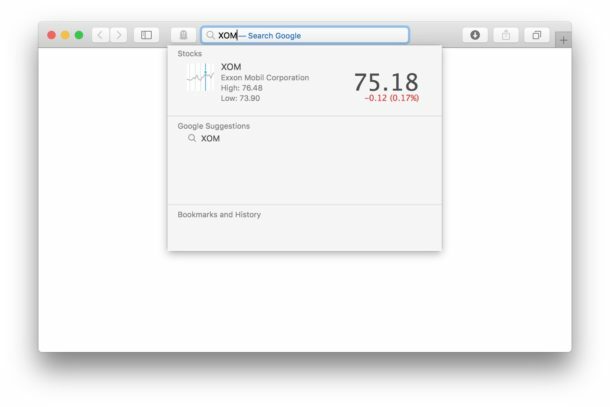 Safari for Mac can quickly give you stock price quotes for any ticker symbol right from the address bar, offering yet another way to keep track of equities for those who like to follow the day-to-day ride of the stock market. 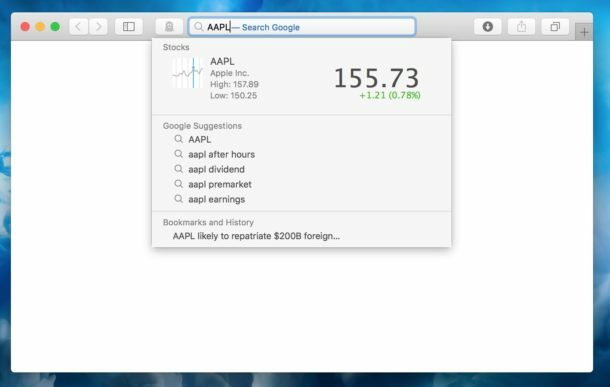 Of course you can just google or web-search for a ticker symbol too, but a Safari feature called Safari Suggestions offers an ultrafast way of getting the price of a stock without having to search the web, all you need is the ticker symbol. That’s all there is to it. You can check just about any stock symbol this way, and most ETF and mutual funds should work too, though I have found there are some that are not detected as ticker symbols properly and don’t show up with a price quote. Note that if you disabled Safari Suggestions on the Mac then the stock ticker symbol lookup trick will not work. Those settings can be accessed in the Safari Preferences and are enabled by default, but some users may have turned the feature off if Safari was freezing up when the address bar is selected, something that can occasionally happen on older Macs or slower internet connections.The Safari Suggestions feature is different from the search suggestions feature, which offers suggestions of similar search items in the Safari URL bar as you type. Each can be enabled or disable independently if desired, much like you can hide the Favorites dropdown menu in Mac Safari too. This is just one of myriad ways to get stock quotes on a Mac, you can also get current prices of ticker symbols with Spotlight, from the Notification Center Stocks section, with a Dashboard widget, or with Siri too. So whether you’re a bull or bear, you’re never far from knowing where the market is moving, or just in case you want to know how much money you’d have if you had bought Apple stock instead of Apple products if you want a subtle reminder to invest for the future. Doesn’t work for “BP” (British Petroleum but listed on the NYSE). Doesn’t work for Singapore or Hong Kong stock exchanges. I don’t know about other countries. @MikeD – Try including a space after BP. That brings it up for me. I doubt most of the young kids that follow this site have any money invested in the stock market. There’s a lot, especially short ones and the main index (Dow Jones Ind. Ave.) DJI doesn’t either. It’s neat and helpful to some but very limited. Just sayin’. @JohnP – I usually can get prices for short-titled symbols by typing a space then “sto”. I just tried it with DJI and it works. I’m not sure, but AAPL is the only one I tried that actually works. Even the XOM in the second screenshot does not work? They all work on the iPad. I think the data display (charts, etc) are actually more robust on the iPad for some reason. Works if Google is the default search engine. Fails if the default is Duck Duck Go. It also works on Safari for iOS on iphone and ipad. Why it’s not working for me at all ? not on Mac nor on my iPhone. It doesn’t work in Europe ?